Today we welcome back frequent visitor Judy Alter. Judy writes three different mystery series as well as historical fiction based on the lives of women in the nineteenth century American West. She’s recently written a cookbook and is here today to tell us about it. Learn more about Judy and her books at her website. A little more than two years ago I moved from a 2,000-square-foot house, where I’d lived for twenty-five years, into a 600-square-foot cottage (a remodeled garage/guest house) on the same property. It meant downsizing big time. My daughter and I were ruthless about clothes, books, even my beloved but appalling recipe collection. And kitchen utensils. Size dictated that my kitchen be the size of a postage stamp, so it is way short on counter space. A bigger complication: local zoning laws forbid more than one full kitchen on a property. That means I cannot have built-in appliances such as a stove or dishwasher. Anything you plug in is okay, so I have a large refrigerator, toaster oven, magnetic hot plate, and coffee maker. I do not have a microwave, an Instant Pot, an air fryer, or a crock pot. My cooking changed dramatically. My magnetic hot plate became the center of my cooking. I learned to do all kinds of things on it. I also learned that it cooks hot and fast—and you have to push the start button. That was a biggie. The first time I used it, I set the temperature I wanted and waited for the pan to heat. My daughter was with me. We put a lamb chop in the pan. Nothing. No sizzle. She held her hand out to feel heat, put her ear down, poked the meat. Nothing. Then we saw the start button. The hot plate requires special pots and pans, which of course you buy from the company that sold you the hot plate. Gone, with regret, are the days of cooking in a cast-iron skillet. These new pots and pans will scorch food if you turn your back, but they are super easy to clean, and I have one large pot in which I can simmer a pot of soup all day. But with one hot plate, you cannot, for instance, cook pasta and sauce at the same time. If I use the hot plate and the toaster oven, I blow a fuse. So I developed a new technique. If the pasta must sit a bit while I fix the sauce, I stir just a bit of olive oil in to keep it from clumping. Then I give it a quick re-heat before adding the sauce. Gradually, as I learned new techniques, the idea for a cookbook formed. A friend suggested the title, Gourmet on a Hot Plate, and I began collecting recipes for the things I cooked—some new experiments, many old familiar dishes adapted to my new situation. Believe me, there were some disasters. I regularly burned things, even in the toaster, which set off the smoke alarm more than once. The smoke alarm hurts my dog’s ears, and she associates it with the toaster, so Sophie now begins barking when she sees me with a slice of bread in my hands. But Gourmet on a Hot Plate includes lots of cooking tips along with some tasty recipes. 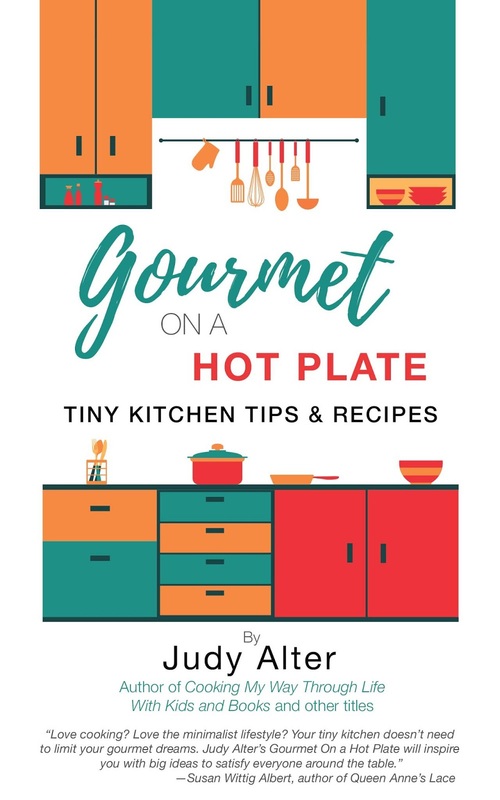 Gourmet on a Hot Plate will be available as an e-book and in print November 15, perfect for holiday gift giving. It’s currently available for pre-order. 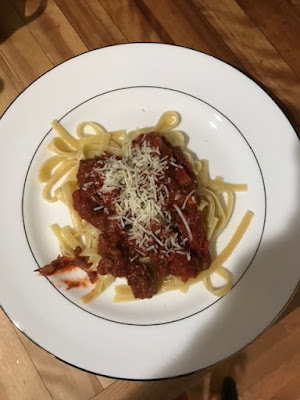 Meantime, here’s a spaghetti sauce recipe a good friend contributed. Her mom got it from a woman in Rome in 1950. When I made it, even twelve-year-old Jacob said it was good, really good—and such praise is hard to come by. Cook the onions and garlic in olive oil until onions are slightly softened. Add spices and mix thoroughly. Add tomato paste, puree and diced tomatoes, and stir well. Simmer on low heat for about three hours or in a slow cooker for six hours. Serve with your favorite pasta and fresh grated Parmesan. Without formal culinary training, Judy Alter has cooked her way through life, feeding family and friends at everything from casual dinners al fresco to elaborate meals for twenty. An award-winning author and publisher, she jokes she’ll come back in another life as a chef. Today Alter finds herself cooking in a four-by-six kitchen where zoning laws forbid built-ins but allow anything that plugs in. So she cooks with a hot plate, a toaster oven, and a large refrigerator/freezer. Given these limitations, she has developed a new approach to food, one that she says lets her get in touch with the food itself. By choice, she does not have an Instant Pot, an air-fryer, or a microwave. Her menu choices are dictated by her cooking facilities—and she loves it. 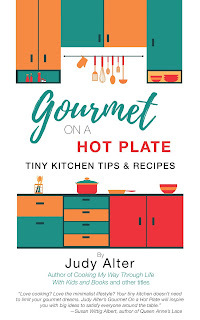 She shares her tiny kitchen tips and recipes, developed over the past couple of years, in Gourmet on a Hot Plate. Thanks, Maria--RV dwellers are a whole new audience I'd not targeted. Enjoy the spaghetti! I would add a small crockpot if I had to give up my stove. I don't use the microwave already. I like the small products made by the Dash company. I have the egg cooker, as I have always been rubbish with timing a good hard-boiled egg. They come out great! I am asking for the little waffle maker for Christmas. It makes one waffle at a time, which is great for me. This sounds yummy over the computer! I would love all the small appliances you all mention--a crockpot, and a single waffle thing--but space, both on the counter and in the drawers, Is at a premium. I do have a small food processor and a hand mixer. My ace in the hole is that If I plan ahead I can send larger things into the "big house" where my daughter and her family now live. But I have only done that two or three times in over two years. But, Deb, I can boil eggs--I think my method is in the cookbook. Bring them to a hard boil, with a dash of vinegar in the water to keep the whites from leeching out, and then turn them off and let them sit until room temperature. With the Holidays approaching, I imagine there are some good recipes here. Thanks for sharing. Nothing big like a new way to cook your turkey, Angela, but some good appetizers and side dishes. And smaller suppers for the "other" meals while you plan the big one. Most recipes fee two to four. This is such a wonderful idea for a cookbook, Judy! Residents in tiny homes, RVs, senior living, and more, will be glad for your creative ideas. Love your boiled egg technique, and the spaghetti sauce sounds rich with flavor. Big cheers for you! And thanks to Killer Crafts & Crafty Killers for hosting! Congratulations on finding a new and special niche for your cooking talents, Judy! May your book find many, many cooks like me who love living in a tiny home. You've brought me here for my first visit to Killer Crafts Y Crafty Killers and I must say this is a delightful place in cyberspace! I've bookmarked the site. It's fabulous!